"I don't get why that is art!" 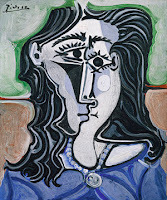 Whenever I show Picasso's cubism paintings, I have a handful of students that say, "That's Art? I could do that in KINDERGARDEN!" 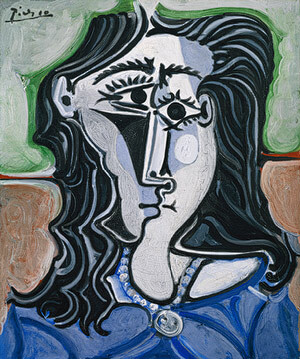 What I always respond with is an image of some of Pablo Picasso's most meticulous realistic drawings/paintings. I ask those students, "And who do you think did these?" The most difficult thing for us to understand is how art is made. I believe that everything that we imagine is something to we have already seen in some form or another. I believe that it is beyond our brain's ability to come up with something unfathomable. I explain to my students using the aliens analogy. Aliens we imagine up tend to have arms and legs, maybe some drooling fangs, or skeletal features. Maybe some aliens we think of are gooey amoeba-like creatures (or even cars that transform into gigantic robots...?). Regardless, somewhere in nature we can find references to these descriptions. Art is very similar. Do we really come up with something completely new and original? Something never seen before? Or, do we simply just give a new perspective, a different way of seeing things to our vision? For example, Picasso represented still life setups or portraits (nothing new), but presented it in a way that was completely beyond anything we as humans had envisioned before. 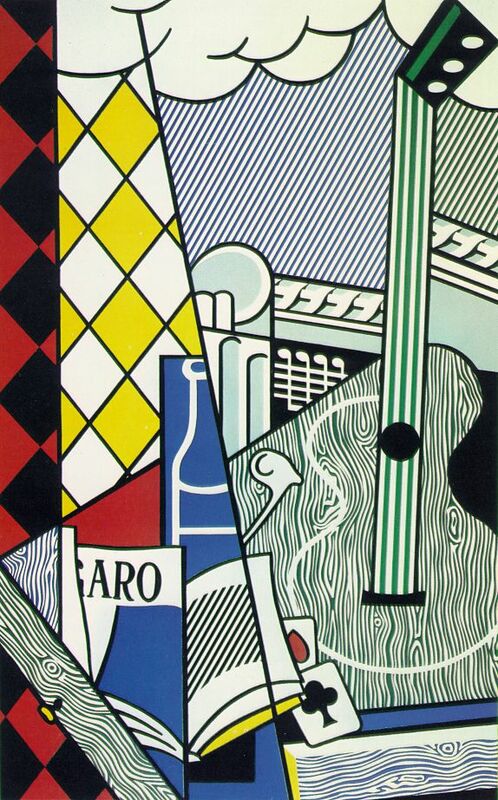 And THAT is why Picasso's abstract cubist paintings are so profound. So why not do what we do with aliens and IMITATE? Ok, let's not call it imitate, but rather... borrow with intents of homage! 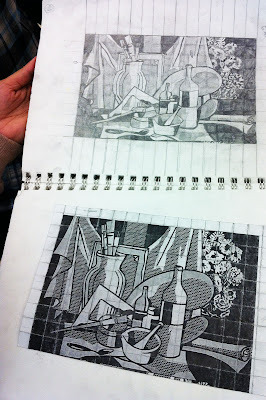 Often times ART 1 students are very intimidated by the idea of drawing. Drawing ANYTHING can be the most daunting of tasks, none the less drawing themselves. The first thing I did was a one to two week practice project on how to use a grid to transfer an image. I talked about my experience as a scenic artist and the idea of using a small 8.5" x 11" image and translating it to a humungous 80' x 20' backdrop. I, of course... being the most masterful artists alive, would, of course, just freehand it perfectly. BUT! For those who are just not as talented as I, there is the grid transfer technique. 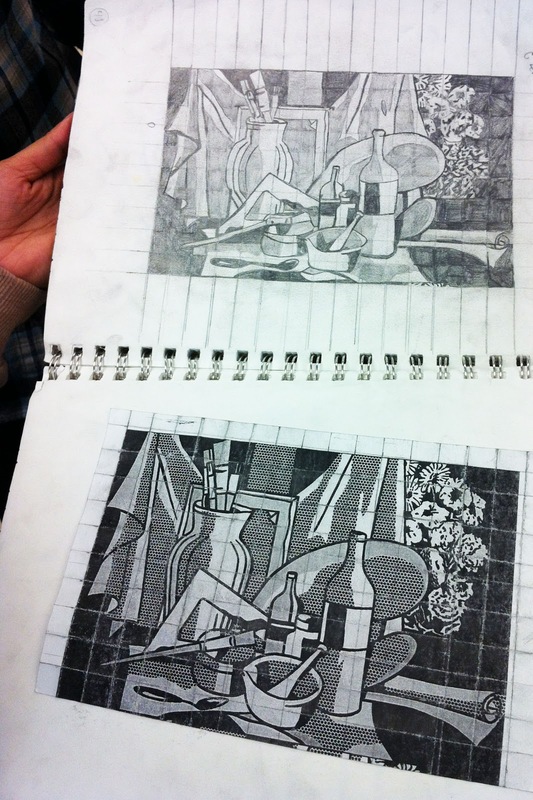 Sarcasm aside, I gave the students a set of drawings to use as their very first grid transfer project inspired by none other than... Roy Lichtenstein! You might be wondering why in the world I would choose him as our inspiration. 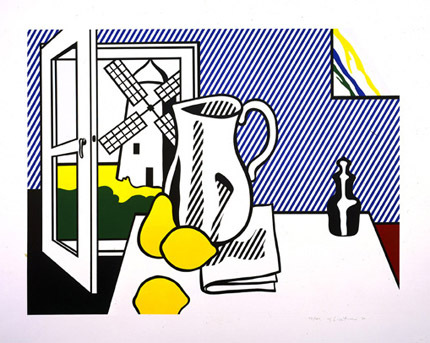 Reason 3: Mr. Lichtenstein borrows cubism in some of his works! While students were practicing the using the grid transfer, I took (delegated to a trustworthy student in each class) portrait photos of each student , both profile AND front. You might be surprised at how many students do not (yes, this is indeed high school 9-12 grades) know how to use a ruler. And you might be even more surprised by how many students can not simply comprehend how to make a grid with square boxes. So, this process is actually way more needy and time-consuming than you might think or hope. who need a bit more challenge. Over the weekend, I attempted to do this project in a way that would allow an easy step by step process. I started to literally have an anxiety attack when I realized that this might be WAY too complex of a project for them, and I might have to scrap the entire thing! All that wasted time!! Alas, I figured it out. 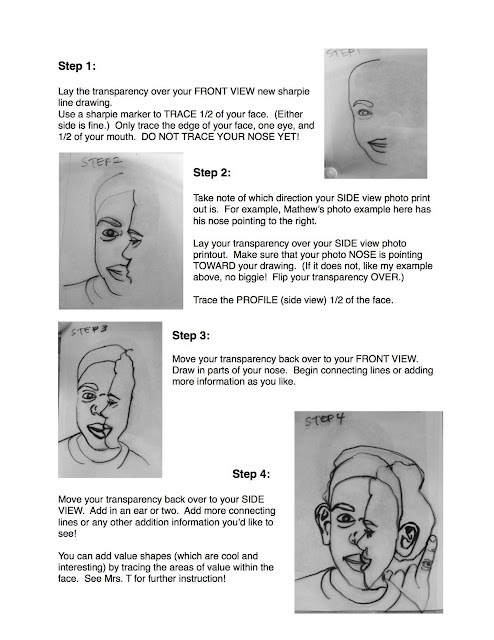 You can see here my step by step handout that explains the next process. How To Cube Yo' Face! I started by having the students pencil draw their face as a coloring book (in their terms). Then, in exchange for their ID, I give them a sharpie to draw over the lines of their photo. Turning the paper over, they can see if they missed anything, or need to add any other details as the sharpie bleeds through the paper. Then, the reinforce those lines on the back again with sharpie. Next, they use a 4.25" x 5.5" transparency to lay over their line drawings. They basically move back and forth across the two images to "collect" information from each point of view. This is a difficult concept for the students to grasp. Some tend to get it right away, others need to be coached through each step. What I've been seeing so far, though, is that they are really engaged in this project and are doing a great job Cubifying their face! After this process, I printed out grids that student can tape to the backside of their transparency. (AHA! That's how the grid transfer project comes into play!) They will transfer their new portrait from this small transparency to a 12" x 18" piece of sulphite drawing paper. After that, they add in geometric lines across the entire piece. Once that is completed, they will use sharpies to create different line weights (thank you, Line Unit! 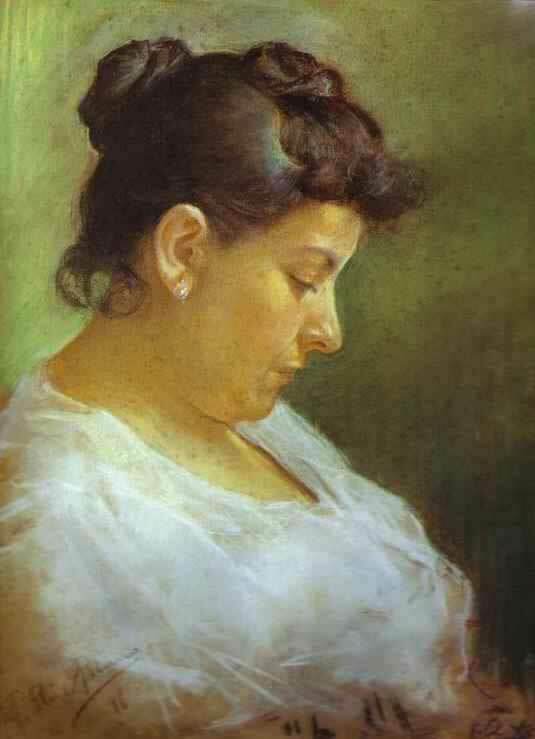 ), in order to emphasis different features that are most important in their portraits. Lastly, students will choose a color scheme of their choice (thank you, Color Unit and yet another tie-in to the "I CAN! 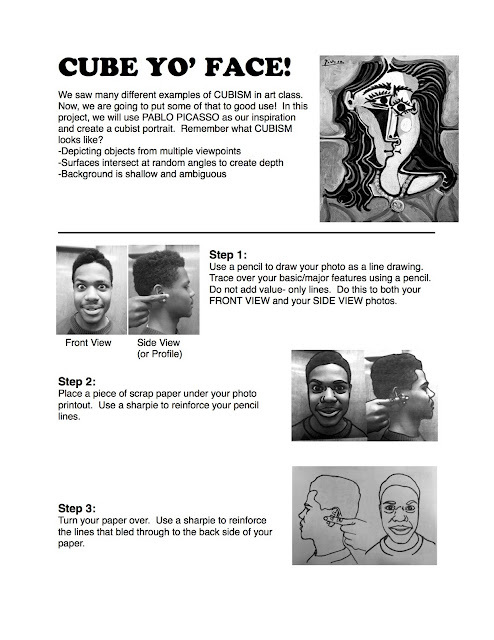 Pop Art" handout/worksheet!) 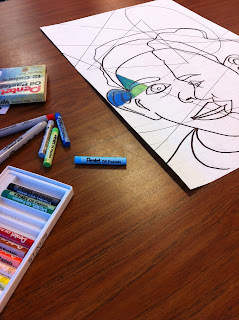 and use oil pastels to color each portion of their new face. I will post process shots and finished products when we finish up in the next week or two! I'm SO EXCITED!!!! Please ignore the strange "matting." the "different sides" to Brian. 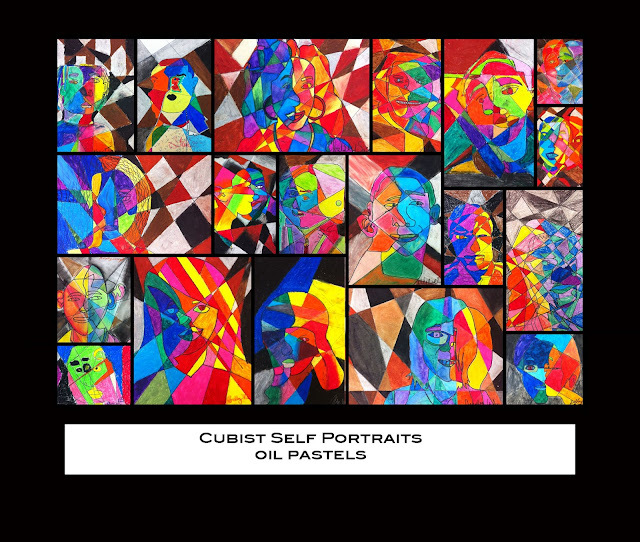 Now that the students have been diligently working on creating their very own Cubist Portrait, I have some updates to add! Here are some process shots of my full size example for the students to watch as I demonstrated different processes. Maybe we should just move to the metric system because students don't know how to measure, anyway! In the photo to the left, I have transferred my small transparency image using a pre made scaled grid I made for the students. We are using 12" x 18" sulphite drawing paper, so I scaled my mini grids for perfect square- nice and easy! 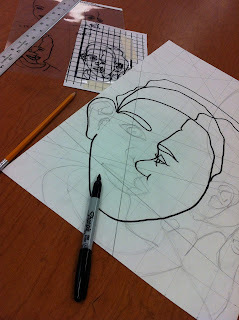 Students just taped their transparencies to the grid using creative composition within the thicker black paper border. Some students chose landscape orientation, while others chose portrait. It was a good opportunity to reinforce the idea of "grounding" the subject... and not having a floating head! None-the-less, there were still a few students who ended up with floating heads. Next, the students drew a 1.5" square grid on their sulphite paper, which left them with the perfect amount of boxes from their mini grids. You might think it would be easy for a high schooler to measure 1.5" and make marks around the entire edge of the paper, and then use the ruler to connect the marks. You would be SO WRONG! I'm not sure when measuring skills went out the window, but apparently it was before they hit 9th grade. I learned this lesson during student teaching (students had to distinguish between sticks that were 1/8" thick and 1" thick in order to roll even clay slabs, and I ended up making a giant ruler for them to place the stick up against...). But it still ceases to amaze me. So I always start out by saying, "I know it may sound funny to some, but I realize that you have all had the disservice of not learning how to properly use a ruler to measure." And then students giggle. But I proceed with, "So if you need help, I have no problem showing you how to use a ruler and measure." Then, more than half of my students either ask for help, or measure incorrectly to make their grid. Oh boy. (Some don't measure at all...) Also... you have to remind the students to draw the grid LIGHTLY (i.e. pencil pressure)- and I learned to always say, "BECAUSE YOU WILL HAVE TO ERASE IT!" That seems to be the only way students actually follow that direction. After transferring their portrait drawings, they used sharpie on the edge to create thick line weight to trace over their drawing. I talked to them about using their wrist as a pivot point and moving the paper to create strong, fluid lines. 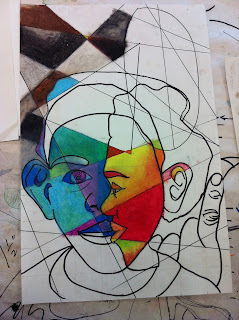 Once that was complete, students used a pencil and a ruler to create a "geometric breakup." Using a light line weight, students traced the geometric lines. Lastly, they erased all pencil lines to prepare for the oil pastels! Next, students actually transferred their images to the large paper. Even though we did a whole exercise on how this looks, students struggled with the idea that this image should look exactly the same only BIGGER. Some students made a tiny head in the middle of their large paper. That's when I remind them to look at the picture box by box. For some students, the image plus grid is just too visually overwhelming. So, for those students, I cut out a little window for them to place on the grid so they could ONLY look at one box at a time. "I don't like this stuff on my hands 1st period, Mrs. Taylor!" "Oil pastels are like chalk and crayons put together. They are awesome because they can create a super intense color like this (demonstration), but can also smudge like this (demo)! And I can combine colors like this (demo)! Cool, huh? Now, you will be using your knowledge that you tucked into your elements of design trunk in order to complete this artwork. We will need to use cool and warm colors in the face- but half of the face will be warm colors, and half will be cool! Remember, warm colors are like the sun... or sunset (asking students...), and cool colors remind us of winter, ice, and just COLD in general (asking students)! The background will be blacks, browns, grays- all neutrals. I want you to stop looking at your work as your portrait at this point, and start looking at the SHAPES that have been created with your organic and geometric lines. Each shape will have a unique color. 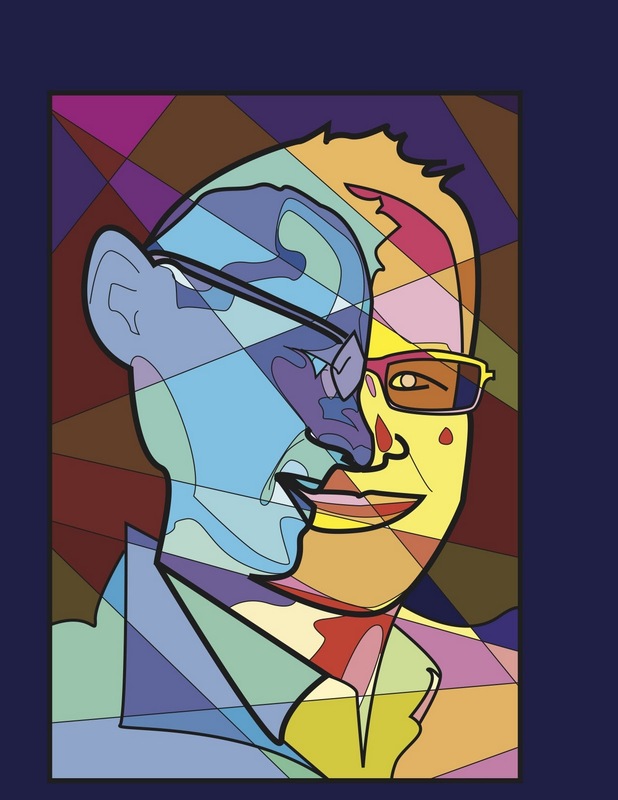 You can, of course, replicate colors if you like, but no adjacent shape should share the same exact color."